D'ARTAGNAN, a Ferretti 630, represented a new challenge for the experienced team made by Zuccon International Project Studio and the Engineering Division of Ferretti Yachts which designed a superb yacht incomparable for space and brightness. 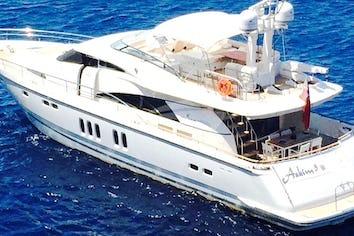 D'ARTAGNAN is a 65' overall flybridge of excellent nautical qualities, spacious and bright. Ferretti shipyard defines this yacht with her purity of lines, perfection of style, high quality and capacity of interior and exterior arrangement, a yacht out of the time who can offer to his guests, 6 cruising and 10 for daily sailing, full comfort and relax. The boat is fully equipped at the top level from the satellite dish, wi fi, water games. 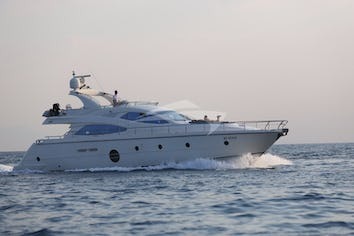 The expansive and bright saloon with the forward dining area, the spacious cockpit with two convertible tables, the enjoyable flying bridge with wide sun beds, offer the possibility to fully enjoy the yacht and the sea. A sharp and extremely aggressive external line with an innovative spherical window that extends from aft to the bow giving 360° visibility of the sea. Below deck the Master, VIP and Guest cabins have elegant fittings and take advantage of the exceptional reorganization of space. The large open view window in the Master cabin is fundamental for optimizing space and gives the yacht a fantastic view even in navigation and the feeling of a much larger vessel. Refit: In 2016 / 2017 the stern of the yacht has been fully modified through the displacement of the central gangway and the creation of a wonderful leaving space with a comfortable sun mattress and a large central table. Various equipment have been installed like a desalinator, an icemaker, TV in each cabin and others. The yacht is fully equipped at the top level. Various equipment have been installed like a desalinator, an icemaker, TV in each cabin and others. Crew is composed by two professional and excellent members: Captain and Chef/Deckhand. Education: Licence of Nautical Institute in Anzio, Rome. Certificate of Competence Master 500 unlimited. Francesco was born in Anzio, near Rome, a beautiful place surrounded by the sea famous for being the place where American and the British soldiers landed to save Italian people from the war. Third of a six brothers family in Anzio, where the fishing vessel and sailing boats were part of the landscape, Francesco has always had a passion for boats and this passion brought him towards the sport practice of the sail. During his school education he decided to deepen his studies in the nautical field and he decided to attend the Nautical Institute where he graduated on June 2000. After his degree he attended several trainings to reach professional certifications and he started working as deckhand on Rizzardi Technema 70’ from 2004 to 2006 to arrive nowadays to be a qualified person in the nautical field having more than 15 years experience on board of yachts. Francesco worked for the most important yacht companies such as Hill Robinson Yacht Management from 2006 to 2011 and for Imperial Yacht Management from December 2011 to February 2018, always for the same owner, on a Sunseeker 82’ as co-captain and officer of the watch. Francesco’s nautical experience goes from technical, engeniering and ability to perform any kind of work needed on board which he gladly shares with his team, he is a very good team leader able to managing a crew and at the same time he is polite and discreet with the guests. He loves creating a good vibe and keeping always a welcoming at the top. Francesco is at the same time a sportsman, he love running, swimming, sailing and race biking too. Spoken languages: italian (mother tongue), english (very good). Young and brilliant young sailor from La Maddalena, Sardinia where he got his deep experience in many activilties connected to the sea. 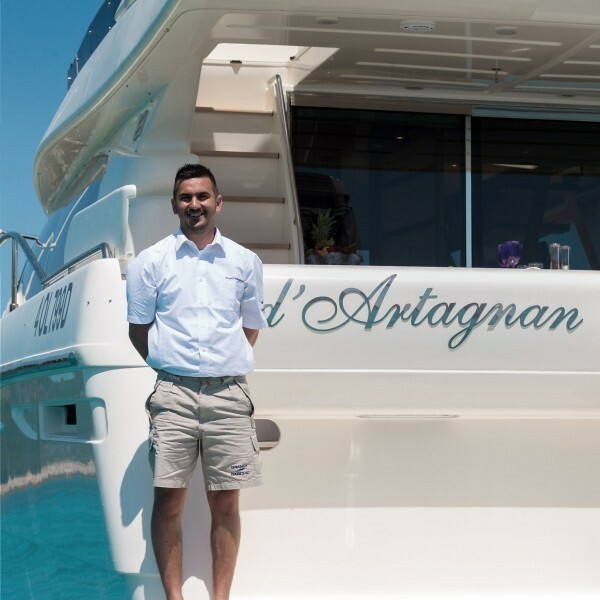 In his short work experience he has been responsible for four years of a Marina in La Maddalena, Sailor / chef on board of Oyster 65’ for two years, sailing along the mediterranean coasts and Captain/ Chef of motor yacht of 11 meters operating in the Archipelago of La Maddalena. 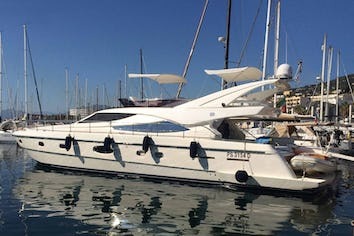 He graduated from high school in La Maddalena, he is also studying to graduate to 'Nautical Institute “ and attended courses to become officer of pleasure yachts; Incidentally, during winter time he also follows the Economics and Management on line courses of the Unicusano university in Rome. He has a very good knowledge of English. Alessandro excellent preparation as a chef comes from the family (his father being a Chef too). x d'Artagnan e tutto l'equipaggio, é stato un piacere ed un onore fare il primo viaggio. Spero che in avvenire avrò l'occasione di approfittare della vostra accoglienza ! Caramente Arturo L "
"Dear Michele and Diego, the trip was an unforgettable adventure spending 14 days with both of you. Going to all the different islands together and creating memories. I am so greatful to have met both of you. Thank you for showing us all the different islands and what there is to do there. P.S. The food was amzing. Diego and Lauren"
"Dear Michele and Diego, thank you for taking us through Corsica and sardinia. The fun started from day one, when we got in the water at the Isle Rousse. My favourite city was La Maddalena, it was beautiful. Diego, thank you for the eggs wou made us every morning and always keeping the table full of bueno bars ! This is a trip I'll never forget. Jonathan. " "Dear Michele and Diego, we have spent 15 days abord de d'Artagnan and your attention and your service to us, has been exquisite. Ithanks you both for your generosity and kindness during my family holiday . As you saw with your own eyes we are a very simple family and we enjoyed your company. We wish you many years together as a Team and much success in the years ahead. Kind regards. B... family"
Michele y Diego, les doy las gracias de hacer mi viaje a Cerdena invidiable. Me divertì muchisimo con usteds y estoy seguro que no podrìamos haber tenido estas tan maravillosas vacaciones si no fuese para ustedes. Los lugares que màs me gustaron fueron Tahiti (la Maddalena ) y la playa en Bonifacio, que nunca habìa ido a unas playas tan .... y lindas. El yate estava siempre muy limpio y ordenado. Me fascinaron estas alucnantes vacaciones. GRACIAS ! Renzo Jr."